Both Olympic Sportswear kits for the 1999/2000 season were designed to help commemorate the 90th Anniversary of the Club’s formation. However, instead of bringing out the regular white Away kit, United released a special edition 90th Anniversary shirt. 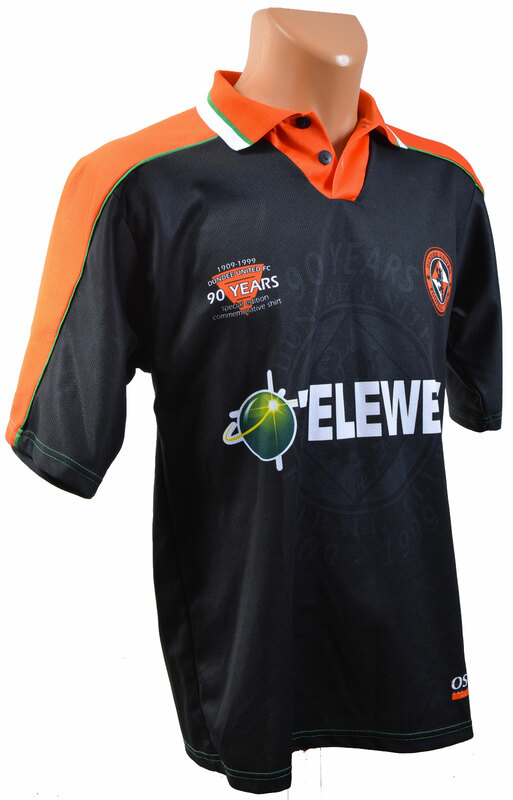 The black shirt had a large opaque version of the Club badge printed into the material, with the words “Ninetieth Anniversary” above and below, with think tangerine strips down each arm from the collar to the cuffs, along with a green trim as a slight nod to the Club's colours when they were formed as Dundee Hibernian. The polo style collar had a V shaped tangerine placket with two buttons, with white and green trim on the lapels. As with the Home shirt, the Club badge and manufacturers logo were printed into the material of the shirt, as was the Telewest logo. The shorts were a standard black with tangerine strip down the sides, and the Club badge on the bottom right. When required, the white Away shirt from the 1998/99 season was called into action. However, the Anniversary shirt was worn twice during pre-season, in friendly matches against Newcastle and Middlesborough, but during the season itself it was worn only once in the final game of the 1999/2000 season in a 0-2 defeat to Celtic, as United finished just 6 points above bottom placed Aberdeen after the team struggled to cope with the loss of Billy Dodds after his transfer to Rangers in December.